This luxurious and romantic adults-only all-suite resort is designed to reflect the charm of the Mexican Caribbean. Bordered by sugar-white beaches and the brilliant, turquoise Caribbean Sea, it is minutes from Cancun and the eclectic Playa del Carmen. Guests luxuriate in private and spacious accommodations with each suite having at least one Jacuzzi®, marble bathrooms, and a wealth of amenities and superior service. 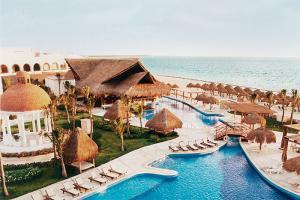 Located just 30 minutes south of Cancun and situated on a magnificent stretch of white-sand beach in the Riviera Maya. Choice of 6 restaurants, featuring Continental, Mexican, Japanese, Steak & Seafood, and Gourmet cuisines; 9 bars. San Felipe Fort, Chetumal Museum of Maya Culture, Chacambacam, Bacalar, Golden Crocodrile Cenote, Chichan-Ha, Huay-Pix, Tulum, Coba and Chichen-Itza.